As it is natural for devotees (who are fully focussed on bhagavAn alone) to share and discuss the svarUpa (divine nature), rUpa (forms), guNa (qualities), chEshtitha (activities), etc., of bhagavAn with many and seeing that there is not many who are purely focussed on bhagavAn alone, nammAzhwAr considers “Even if we have to transform them to be purely focussed on bhagavAn alone let that happen and then we can share this experience together” and starts instructing detachment towards wordly matters which is the first step in bhakthi yOgam which is a means to becoming fully focussed on bhagavAn. nammAzhwAr, after enjoying emperumAn‘s parathvam (supremacy), being blissful, as explained in bhagavath gIthA 10.9 “bhOdhayantha: parasparam” (discussing with each other) – one cannot bear without discussing with others about these divine matters and realises that there is none qualified to have discussion with him. nammAzhwAr contemplates the method to reform worldly people and share these divine matters with them. He realizes that “chEthanas (sentients – ones with knowledge) usually reject/avoid unfavourable aspects and accept favourable aspects. Similarly, Let me highlight what is unfavourable for them in this samsAram and the enjoyable nature of bhagavath vishayam and reform them” and instructs them about the temporary and insignificant nature of this world and the pure bhagavAn who is filled with auspicious qualities and instructs them to pursue bhakthi yOgam to worship him. nammAzhwAr mercifully explains the process of worshiping emperumAn through parOpadhEsam (instructions to others) in this decad. Since emperumAn is the sarvasmAthparan (most supreme) and he is to be worshipped, aspects that are considered as hurdles in his worship are to be given up. AzhwAr explains how such unfavourable aspects to be given up. He also explains the insignificant nature of worldly matters and the glorious nature of bhagavAn. He also explains how the hurdles are removed and the true goal is accomplished. mOksha sAsthram has 2 aspects – thathvam (truth about the entities) and upAsanam (process to achieve mOksham). In the first decad, thathvam is explained clearly. This decad is the summary of upAsanam related aspects. thirumAlai ANdAn explains this decad with respect to prapaththi as heard from ALavandhAr. emperumAnAr too was doing the same until he completed srI bhAshyam (commentary from vEdhAntha/brahma sUthram). Subsequent to completion of bhAshyam (to present consistent views between vEdhAntham and thiruvAimozhi), he started explaining this decad with respect to bhakthi yOgam. embAr too followed the same principle. nammAzhwAr‘s bhakthi (devotion) and prapaththi (surrender) are indistinguishable (in one aspect he looks like performing prapaththi and in another aspect he looks like performing bhakthi) and he has abundance of both (due to his unflinching love/devotion towards emperumAn). nammAzhwAr was fully blessed by emperumAn with blemishless knowledge and he in turn performs saraNAgathi to emperumAn in various pAsurams. So, his bhatkthi itself was blessed by bhagavAn and his bhakthi is some thing which is part of the goal (to perform kainkaryam one needs devotion – that devotion/desire is AzhwAr’s bhakthi which was blessed by bhagavAn himself). bhakthi is explained as supported/decorated by karmA (activity) and gyAnam (knowledge) – i.e., by following the process of karma yOgam and gyAna yOgam, one’s mind gets purified and engages in bhakthi yOgam. But for AzhwAr, bhagavAn‘s mercy takes the role of karmam and gyAnam. Since he has full knowledge of everything (and not a confused person) – he would not practice one thing (saraNAgathi/sAdhya bhakthi) and instruct some thing else (sAdhana bhakthi yOgam) to others. Based on previous point, If we say, he is instructing sAdhana bhakthi, then his own greatness that “he was fully blessed with blemishless knowledge/devotion by bhagavAn‘s causeless mercy” will become invalidated. Finally, “apasUdhrAdhikaraNa nyAyam” which explains that “sUdhra (persons of 4th varNam) cannot engage in sAdhana bhakthi” will be invalidated. This is explained in detail in arumpadham. There was a virtuous king named jAnasruthi. When two rishis wanted to bless him, they took the form of 2 hamsa (swan) birds and flew on top of him. While crossing him, one bird told the other “please ensure that your shadow does not follow on jAna sruthi (since he is a virtuous king)”. The other bird asks “Why should I be careful? Is he like raikva?”. Hearing this jAnasruthi went searching for the mahAn named raikva (who he understood to be a great mahAn from the words of the second bird). He found raikva to be in the most abominable form and yet requested him to teach brahma vidhyA. First raikva says he should perform service to learn brahma vidhyA. jAnasruthi replies he does not have time to perform service to raikva due to administrative duties. Then raikva says “bring lots of wealth” and jAnasruthi obliges and offers his everything. Seeing his great desire raikva says that since jAnasruthi is a sUdhra, he will teach him brahma vidhyA. emperumAnAr while explaining the word “sUdhra” here, says that one who have not undergone upanayanam (sUdhra) is not qualified to learn brahma vidhyA. But he explains that, here sUdhra is explained as “sOchanAssUdhra:” (one who is with sorrow is a sUdhra) – since jAnasruthi was lamenting greatly due to lack of brahma vidhyA, he is qualified to learn the same. Thus, while sAdhana bhakthi is only applicable for thraivarNikas (brAhmaNa, kshathriya and vaisya), sAdhya bhakthi is applicable for everyone. And since nammAzhwAr is instructing to all jIvAthmAs who are bound in this material world, he is explaining sAdhya bhakthi only. From the above, it is concluded that nammAzhwAr is instructing the same sAdhya bhakthi (which he received from bhagavAn out of his unconditional grace) to others. A few questions arise on why he is instructing to others after fully experiencing bhagavAn in the previous decad. Is he instructing others since he has seen bhagavath vishayam fully (and there is nothing left to experience)? No. As he himself explains in thiruvAimozhi itself, there is no end to bhagavAn‘s glories and it cannot ever be fully experienced. He himself too has unlimited desire to experience bhagavAn more and more. So, this is not the reason. In some cases, one develops taste towards something but after sometime, one will start losing interest. Is bhagavath vishayam like that? No, as he himself says in thiruvAimozhi 2.5.4 “eppozhuthum nAL thingaL ANdu Uzhi UzhithoRum appozhuthaikku appozhuthu en ArAvamuthE” (Always day, month, year, epoch after epoch, everytime you are so new and nectarean) – he is ever tasteful. Is this for AzhwAr to be seated as an AchArya (master)? No. Is this for name, wealth and fame? No. Is it to fulfill injunctions of sAsthram that says an AchArya must teach the sishya? No. His teachings are the outcome of his own overflowing blissful experience. bhagavath vishayam is not to be enjoyed alone. He seeks out for good companions to share this blissful knowledge and only finds samsAris (materialistic persons). Just like he was attached to bhagavath vishayam, samsAris were attached to worldly pleasures. He could not bear the suffering of samsAris and desperately wanted to remove their sufferings. nanjIyar often explains “if one has vaishNavathvam (vaishNava quality), he himself will know that. When he sees others sufferings and suffers for that he can consider himself to be a vaishNava. When he sees others sufferings and feels that ‘let them suffer’, he cannot consider himself to be a vaishNava”. To uplift them, AzhwAr explains the limitations of wordly pleasure and benefits of bhagavath vishayam. Realizing that, he explains insignificant/temporary nature of worldly pleasures and the eternal/glorious nature of bhagavAn, bhagavAn‘s relationship to jIvAthmAs are not something new and it is always there for every jIvAthmA, the manthram that is to be pursued for such persons who realize bhagavAn, his most worshippable nature and finally the need for detachment towards worldly pleasures and surrendering to emperumAn. This entry was posted in thiruvAimozhi, thiruvAimozhi 1st centum on April 30, 2015 by Sarathy Thothathri. In the end, nammAzhwAr concludes that these 10 pAsurams are offered as devotional service at the lotus feet of emperumAn who is explained in the 10 pAsurams in great detail (same is explained in nampiLLai‘s introduction). Subsequently, summarizing the supremacy of bhagavAn that is explained previously, AzhwAr declares that the result of (learning/reciting/understanding) this decad is mOksham. In the first pAsuram, bhagavAn having auspicious qualities, being the master of nithya vibhUthi (spiritual realm) and having beautiful and distinct form are explained. In the second pAsuram, bhagavAn‘s svarUpam (true nature) – the abode of the previously said aspects (auspicious qualities, being with spiritual realm and having divine body) – is explained as distinct from chith and achith. In the third pAsuram, AzhwAr enjoys the leelA vibhUthi (material realm) which is similar to nithya vibhUthi in the sense that both are owned/controlled by him. In the fourth pAsuram, AzhwAr says that the leelA vibhUthi’s svarUpam (true nature) is under bhagavAn‘s control. In the fifth pAsuram, AzhwAr says that the existence of the material realm is also under bhagavAn‘s control. In the sixth pAsuram, AzhwAr says that since jagath (material realm) and Iswara share body and soul relationship, the aikyam (union) explained between jagath and Iswara is based on that sarIra-Athma bhAvam. In the eighth pAsuram, AzhwAr refutes kudhrushtis (ones who misinterpret vEdham). In the ninth pAsuram, AzhwAr refutes sUnyavAdhis (ones who reject vEdham and say that everything is void). In the tenth pAsuram, AzhwAr explains the convenient nature of emperumAn‘s vyApthi (omni-presence). Thus, bhagavAn‘s parathvam (supremacy) is elaborately established by AzhwAr previously. In this pAsuram, AzhwAr says that ones who engage in this decad, gets the same result (bhagavath kainkarya mOksham) as him. These 10 pAsurams (which are mercifully spoken and that are most enriching/complete) are offered by nammAzhwAr (who is born in AzhwArthirunagari) at the lotus feet of emperumAn who is the supreme lord and is the abode of pancha bhUtham (AkAsa, vAyu, agni, jalam and bhUmi) and their respective qualities (sound, strength, heat, coolness and forbearance) or has them as his attributes. Just like vAlmIki is glorified in srI rAmAyaNam bAla kaNtam 4.1 for his trustworthy nature, here AzhwAr ‘s trustworthy nature is highlighted. Since the count 1000 is highlighted, bhagavAn who is the divine force behind these pAsurams is established. This padhgam (decad) falls under the thamizh poem category of “kali viruththam“. This thiruvAimozhi (padhigam/decad) explains emperumAn who has two vibhUthis – nithya vibhUthi (spiritual realm – bhOga upakaraNa – tool for his joy) and leelA vibhUthi (material realm – leelA upakaraNa – tool for his sport). AzhwAr focusses this on his lotus feet since it is the most suitable object of worship. Looking at the beauty of the words, meaning, tune, truthful nature of the pAsurams, etc., AzhwAr desires that 1000 such pAsurams are sung to glorify emperumAn. kara visumbu … ivai misai … poRai Ay ninRa – By explaining the five elements and their qualities – leelA vibhUthi is explained. leelA vibhUthi is explained as upalakshaNam (a sample) for nithy vihUthi. 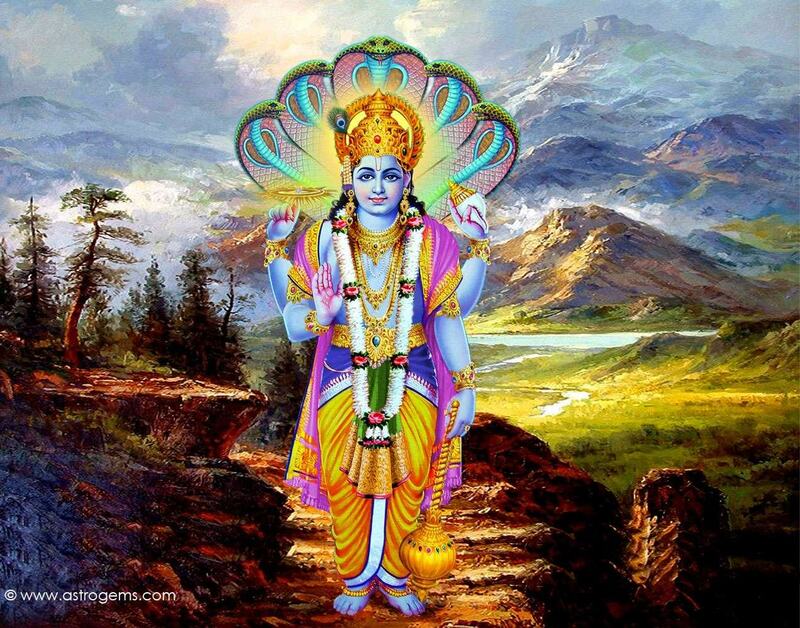 Thus, the supreme lord who is the master of both realms. kurukUrch chatakOpan – As said in srI rAmAyaNam bAla kANtam 4.1 “vAlmIkir bhagavAn rushi:” (the most knowledgable sage vAlmIki), here AzhwAr‘s name is revealed to highlight his trustworthy nature. nira niRai – Can be “niral niRai” (made of best words and filled with great meanings) or “niran niRai” (Having 4 lines where line is similarly composed and matching the tunes of music, etc., in proper anthAdhi (last word/letter in one pAsuram matching next pAsuram’s first word, letter, etc.,) format as explained for srI rAmAyaNam slOkams). 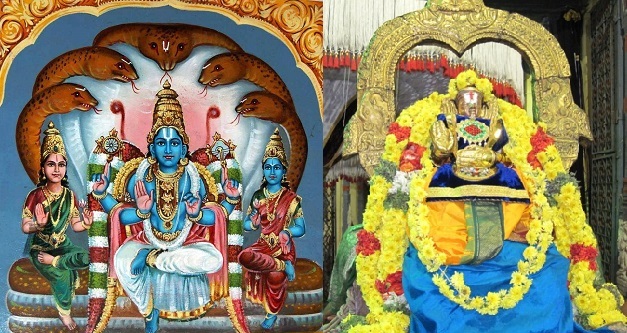 Ayiram – Similar to srI rAmAyaNam bAla kANtam 2.41 “…kAvyam rAmAyaNam kruthsnamIdhrusai: karavANyaham” (Let me compose this epic called srI rAmAyaNm in such manner) which was composed by vAlmIki (by the blessings of brahmA), AzhwAr who was fully blessed by emperumAn with blemishless knowledge declares that he is going to compile these pAsurams. Also, since his experiences cannot be revealed at once, he says he will reveal them in 1000 pAsurams in sequence. Also, it can be said that, since bhagavAn‘s greatness cannot be explained shortly – so, AzhwAr says he will explain them in 1000 pAsurams. ivai paththum vIdE – These are offered at the lotus feet of emperumAn. It can also be explained as – Just like when one looks at a field that has paddy crop and says “this field is filled with paddy” (even when it is not grown, yet indicating the result will be paddy), here, AzhwAr says this 10 pAsurams will lead to vIdu (mOksham). AzhwAr mercifully explains that bhagavAn‘s mercy gave him blemishless knowledge, that knowledge leads him to mOksham and one who engages in this prabandham in any manner, they will also get the same benefit. Thus ends the English translation for thiruvAimozhi 1st centum 1st decad. This entry was posted in thiruvAimozhi, thiruvAimozhi 1st centum on April 13, 2015 by Sarathy Thothathri. bhagavAn pervades in each atom of the drops of water in the ocean, in the subtlest achith (matter) particles that exist from the earth to sky and in the jIvAthmAs that exist inside each such particle. Even inside those jIvAthmAs, he pervades most casually/conveniently as if he is staying (all by himself) in a huge universe. Yet, he is invisible to others and he is the one who annihilates everything. nammAzhwAr instructs his mind to worship the lotus feet of such emperumAn who is clearly established in vEdham. nammAzhwAr explains the convenience of bhagavAn‘s vyApthi (omni-presence that was explained previously) in this pAsuram. Previously nammAzhwAr explained that bhagavAn has the material realm as his subordinate (like body for the soul), the one who is omni-present, the abode of everything, controller and the master. But when jIvAthmA is bound inside a body, he becomes limited with in the limitation of that body – would paramAthmA also go through similar difficulties/limitations? No. He pervades without any limitations in the most convenient manner. Just like staying conveniently (all by himself) in the huge universe, he stays in each drop of the water in the naturally cool ocean in each particle in the most subtle matter. He is present even inside the most minute places and inside the self-effulgent jIvAthmAs who reside in those minute places in such a manner that the pervaded objects does not realize his presence. Him being the omni-present being, he consumed everything during samhAram (annihilation) and remained firm. With this, it is established that bhagavAn is omni-present in both kAraNa dhasai (causal stage) and kArya dhasai (resulting stage) even in the most subtle chith and achith in the most convenient way without any limitation. Included in the introduction itself. parantha thaN paravai uL nIr thoRum paranthu uLan – In the cool and large ocean, bhagavAn is pervaded in every drop of water which itself is made of minute atomic particles. parantha aNdam ithu ena – One may question “Will the bhagavAn who is explained in chAndhOgya upanishath 3.14 as ‘… jyAyAn antharikshAth …’ (though this paramAthmA is in my heart, he is greater than the earth, etc.) be cramped within the minutest atomic particle?” – AzhwAr answers that “No, he stays most conveniently in there as staying in a huge universe by himself”. nila visumbu ozhivaRa – Is he only pervading the minute particles of water? No, he is pervading earth, sky, this universe, all other universes, etc – everywhere which is explained further. karantha sil idanthoRum – everywhere – between the space between eye-lids where minute beings live (and die quickly even by the force of closing the eye-lids) – even in those subtlest beings, he is fully pervaded. idam thigazh poruL thoRum – Even inside the jIvAthmAs of those subtlest beings. karanthu – hidden so that no one sees him, even those entities that are pervaded by him does not see/know him. engum paranthuLan – When a chEthana/jIvAthmA pervades the body in which he lives, he pervades through his knowledge – gyAna vyApthi (i.e., jIvAthmA exist in the heart and through the dharma bhUtha gyAna understands and controls everything related to that body). But bhagavAn‘s vyApthi is not gyAna vyApthi – it is svarUpa vyApthi (pervaded naturally and fully in every place). bhagavAn is vibhu (great) and jIvAthmA is aNu (atomic – minute). ivai uNda karanE – if bhagavAn is great and these atomic particles are how can he stay inside them comfortably without being cramped? He can do it because he is omni-potent (all-capable). As explained by thirumangai AzhwAr in periya thirumozhi 11.5.3 “thayiruNda pon vayiRu ivvEzhulugumuNdum idamudaiththAl” (krishNa’s golden (most-likable) stomach which contains the curd/yoghurt eaten by him, has more space even after consuming the 7 layers of planets) – Just like emperumAn as a small child could consume all of the world and still have space left in his stomach, he can be great yet he can stay comfortably in the minutest particle. karan – who is firmly known by the most authoritative vEdham. This entry was posted in thiruvAimozhi, thiruvAimozhi 1st centum on April 12, 2015 by Sarathy Thothathri. After rejecting kudhrushtis who accept vEdham but misinterpret them, this pAsuram rejects sUnyavAdhi (philosophers of voidness) who says “there is no pramANam (scriptures), there is no pramEyam (goal/bhagavAn); everything is sUnyam (void). Thus there is no vEdham, no bhagavAn (who is the object of vEdham) and no existence of this realm (which is his wealth)”. Subsequently, nammAzhwAr refutes mAdhyamika baudhdha philosophers (a type of sUnyavAdhi – voidness philoshopher) who is considered as the primary amongst vEdha bhAhyas (the ones who reject vEdham). Previously, nammAzhwAr refuted those who partially took some aspects of pramANam (scriptures) and pramEyam (goal) and thus misunderstood bhagavAn‘s svarUpam and his attributes/qualities. In this pAsuram, AzhwAr refutes sUnyavAdhi who rejects both pramANam and pramEyam. Even before the sUnyavAdhi starts giving any reason for his argument, AzhwAr himself declares the truth about bhagavAn who is with vibhUthi (great wealth of (spiritual realm and) material realm). In this pAsuram, nammAzhwAr refutes sarva sUnyavAdhi (one who says everything is void in all aspects). He refutes as done by srI bhAshyakArar (emperumAnAr) in srI bhAsyhyam. Since bhAshyakArar is after the times of AzhwAr, we can conclude that bhAshyakArar writes his refutal in srI bhAshyam based on AzhwAr‘s explanations. Previously kudhrushtis argued that brahmA, rudhran, etc., are supreme based on some pramANams. But AzhwAr establishes that srIman nArAyaNan is the supreme lord, the entire material realm is for his service just like body is for the AthmA and these are revealed in vEdham. When we say “something does not exist”, we first need to define that something and then only reject the existence of that thing. The fact that “something” is defined first, it cannot be made void. Simply saying something does not exist (without defining the entity) will not explain complete voidness. sarva sUnyavAdham (complete voidness) can never be established (If there is a proper word that will always indicate some entity. It can never point to non-existing entity. For example if we say “there is no rabbit” – that means rabbit generally exists but it does not exist here at this place. Even if we create composite words like “rabbit-horn” (which is contradictory since there is no horn for rabbit) and say that does not exist, it will only prove that there is no connection between rabbit and horn – but both rabbit and horn exist separately.Thus, sarva sUnyavAdham can never be established). AzhwAr tells the sUnyavAdhi that you can neither prove voidness by accepting bhagavAn‘s existence nor by rejecting bhagavAn‘s existence. In either case, your desire (of establishing voidness) will not be fulfilled. I will take your word of “bhagavAn does not exist” and prove that bhagavAn exists. Generally, we explain the meaning of a word that indicates the presence or absence of an entity (i.e., when we say something exists, that means that entity exists in a particular place, time and form. Similarly when we say an entity does not exist, that means that entity does not exist in particular place, time and form). If we do not agree to this common platform of debate, you do not have the qualification to participate in the debate. bhagavAn is the substratum for both existence (as per AzhwAr‘s vaidhika philosophy) or non-existence (as per avaidhika philosophies) – so, bhagavAn must be understood/accepted as existing while making a statement about him. He is the one who is pervaded everywhere without ever ceasing to exist and has both with-form and form-less manifestations of this material realm as his two types of aspects which shows and hides him respectively. AzhwAr tells a sUnyavAdhi “You cannot prove bhagavAn‘s non-existence through his presence or absence. In general, bhAvam (presence) or abhAvam (absence) of an entity/attribute is based on the place, time and form. When we say bhagavAn is present, that means he is present with-in gross forms that are visible and when say bhagavAn is absent, that means he is present with-in subtle forms that are invisible. Even for other entities (chith and achith), the same rule applies – they either are present in gross or subtle forms. Thus being with form (gross) or without form (subtle) are just his attributes. Thus in either case he exists”. Thus sUnyavAdhi is refuted. Similar to nampiLLai‘s vyAkyAnam. nanjIyar highlights this pAsuram is explained according to kUraththAzhwAn‘s explanation. avanuruvam ivvuruvugaL – bhagavAn exists with the universe which he controls as explained in bruhadhAraNyaka upanishath “yasya AthmA sarIram yaya pruthivI sarIram” (all jIvAthmAs are his body, earth is his body) and has this universe as his sarIram (body) and sEsham (subordinate) – this is the sthUlarUpam (gross form). When it is said as uLAn alan (he does not exist) he exists in the unmanifested (sUkshma – subtle) form. avanaruvam ivvarugaL – This is explained as the meaning of the word “nAsthi” (non-existence) which really explains a different state of existence. “gatOsthi” (pot exists) indicates an object with an opening at the top with a rounded structure. “gatO nAthi” indicates a different state – when it is not here means it is there else where; when it is not present now means it is present at some other time; it cannot be said that pot does not exist in any form at all times. uLan ena ilan ena ivai guNam udaimaiyil – Having the existence (in gross form) and non-existence (existence in subtle form) as qualities indicate that both of them are his attributes. uLan iru thagaimaiyodu – He has both types of behaviour of being in existence and being not in existence that are indicated by the words “uLan” and “ilan“. ozhivilan paranthE – I (AzhwAr) established his existence through the word “uLan“. You (sUnyavAdhi) established his existence through the word “ilan“. So, both of us have established the truth. AzhwAr also says “Just like his existence is established, can we not understand that he exists with this wealth of nithya vibhUthi (spiritual realm) and leelA vibhUthi (material realm)?”. Note: kAnchI P.B aNNangarAchAryar swamy says in the end of his detailed explanation for this pAsuram in his dhivyArththa dhIpikai commentary – “It cannot be explained in any more detail – this should be heard in detail under learned scholars” – what to speak about this English translation? The translation here is to develop the taste in hearing word-by-word kAlakshEpam of these wonderful granthams which are the only way to get reasonable understanding of these pAsurams. This pAsuram refutes kudhrushtis (one who misinterpret vEdham) who say such sarvEsvaran popularly being established through vEdham is one amongst the dhEvathAs like brahmA who is involved in srushti, rudhran who is involved in samhAram, etc. Subsequently, nammAzhwAr says brahmA and rudhran who are responsible for vyashti srushti (creation of variegated forms) and vyashti samhAram (annihilation of variegated forms) respectively are under the full control of bhagavAn. Some one questions nammAzhwAr “You say that bhagavAn is established by vEdham and is the antharAthmA for every thing. But others are also responsible for certain aspects like brahmA being responsible for creation, rudhran for annihilation, etc. If you say that everything is controlled by one person, then you seem to be biased”. nammAzhwAr replies “I am not biased towards a single person, but if we analyse the pramANams (scriptures), we can understand that those dhEvathAs are not (independantly) performing their responsibilities”. uLan – being the antharyAmi of such brahmA, rudhran, etc. bhagavAn being the cause for mUla prakruthi, etc., which cannot be comprehended by brahmA, rudhran, etc., consumed (annihilated) all of the material realm being the supreme lord of such dhEvathAs, assumes the form of rudhran to destroy the 3 towns (thripura samhAram), annihilated everything, created the variegated forms (again), gave the knowledge to dhEvathAs, etc. He does all of these being the antharyAmi of dhEvathAs such as brahmA, rudhran, etc. As explained in gArggi vidhyai in bruhadhAraNyaka upanishath “kasminnu kalvAkAsa Othascha prOthascha” (mUla prakruthi exists in many different forms) where AkAsa is used to indicate mUla prakruthi, here nammAzhwAr also uses viN (AkAsam) to explain mUla prakruthi. With this, kudhrushtis (those who misinterpret vEdham) who claim brahmA, rudhran, etc., as supreme are refuted. Quoting many pramANams from sAsthram to establish that brahmA was born inside the universe (aNdam – sphere that contains the 14 planetary layers) and rudhran was born as the son of brahmA (Note: There are innumerable such universes with each universe having one brahmA, one rudhran and so on), bhagavAn‘s supremacy is established. nammAzhwAr says that those who are born inside the universe would not understand the mUla prakruthi (primordial matter – unmanifested state), mahAn (manifested matter), ahankAram (ego), etc., that are beyond and outside the scope of such universes. bhagavAn directly performs the samashti srushti first (initial creation of the five elements) and the ultimate samhAram (consuming the remaining items outside the universe). Also, svEthAsvathAra upanishath says “yO brahmANam vidhadhAthi pUrvam…” (bhagavAn created brahmA and taught him vEdham) and mahAbhAratham says “vishNurAthmA bhagavathO bhavasyAmithathEjasa: …” (vishNu is the antharyAmi of siva who is most glorifyable and has great radiance). Through these pramANams, we can understand that emperumAn (who gave gyAnam to dhEvathAs, who helped in thripura dahanam (burning of 3 towns), etc.) is the lord of brahmA, rudhran, etc., since he is the one who performs samashti srushti/samhAram (which are beyond the reach of brahmA, rudhran, etc) and who performs vyashti srushti/samhAram by being the antharyAmi of brahmA, rudhran, etc. surar aRivaru nilai – As explained in brahma sUthram 1.3.9 “aksharam ambarAnthadhruthE:” (aksharam indicates paramAthmA only, since mUla prakruthi which is the source of AkAsam is held by him) and gArggi vidhyai in bruhadhAraNyaka upanishath says “kasminnu kalvAkAsa Othascha prOthascha” (mUla prakruthi exists in many different forms), AkAsa indicates mUla prakruthi here based on kAraNa-kArya bhAvam (cause-effect relationship where mUla prakruthi is the cause and AkAsam is the effect). dhEvathAs starting with brahmA does not understand the true nature of mUIa prakruthi, etc. varan mudhalAy – bhagavAn pervades everything in the subtle state of mUla prakruthi (primordial nature) and the gross state of mahAn (manifested matter), ahankAram , etc – as part of srushti. Since he controls everything by pervading everything, he is explained as the ultimate cause of everything. avai muzhuthuNda – In samhAram too, he is the one who consumes everything. 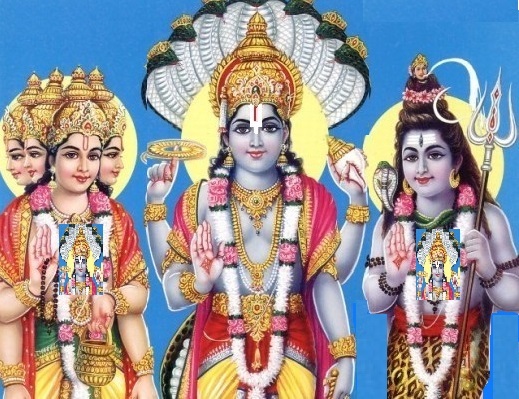 In katavallI 1.2, it is explained that “yasya brahma cha kshthrancha ubhE bhavatha Odhana: | mruthyur yasya upasEchanam | ka iththA vEdha yathra sa: ||” (one who has all brAhmaNas, kshathriyas (indicating all entities) as his food, one who has yama (the lord of death) himself as upasEchanam (like curd, pickle, etc., which are used as side-dish and eaten in the end as well); Who will know the greatness of that great person?). paraparan – brahmA, etc., who are qualified (in some ways) are greater than general population. bhagavAn is much greater than such dhevathAs. This is explained in vishNu purANam 1.2.10 “para: parANAm …” – Different from the great brahmA, rudhran, etc and greater than them. nammAzhwAr himself says in thiruvAimozhi 8.7.5 “manisarkkuth thEvar pOlath thEvarkkum dhEvA” (Just like dhEvas are superior to humans, you are superior to such dhEvas). puram oru mUnREriththu amararkku aRivy iyanthu – It is popularly known that rudhran performed thripura samhAram (destroying the 3 towns) and brahmA gave gyAnam (knowledge) to dhEvas. But if we analyse that, we will understand that, srIman nArAyaNan is the one creates these dhEvathAs and gives them the ability to perform various tasks. In mahAbhAratham karNa parvam, learned scholars such as vyAsa said “vishNurAthmA bhagavathO bhavasyAmithathEjasa: | thasmAdhdhanurgyAsam sparsam sa vishEhE mahEsvara: ||” (vishNu is the antharyAmi for siva who is most courageous and worshippable. It is because of bhagavAn‘s presence as antharyAmi, siva managed to tie the string and launch the bow during thripura samhAram). thirumangai AzhwAr (who is one among the AzhwArs who were blessed by bhagavAn himself with blemishless knowledge) declared in periya thirumozhi 6.1.3 “naNNAr nagaram vizha nanimalai chilai vaLaivu cheythu angazhal niRa ambu athu AnavanE” (emperumAn who became the arrow in the huge bow which is fiery like fire to knock down the 3 towns). In svEthAsvathAra upanishath, it is said that “yO brahmANam vidhdhAthi pUrvam yOvai vEdhAmscha prahiNOthi thasmai” (that bhagavAn who created brahmA first, that bhagavAn who taught vEdham to him). aran ayan ena ulagu azhiththu amaiththu uLAn – In mahAbhAratham sAnthi parvam 169, it is said that “Ethau dhvau vibudhasrEshtau prasAdhakrOdhajau smruthau | thadhAdharsithapanthAnau srushtisamhArakArakau ||” (brahmA and rudhran are best among dhEvathAs who were born out of srIman nArAyaNan‘s mercy and anger (respectively). They are explained in smruthi as the ones who perform creation and annihilation as learnt from srIman nArAyaNan himself). So, as per pramANam (scriptures), they have involvement in creation and annihilation. Since it is emperumAn who performs srushti and samhAram being the antharyAmi of brahmA and rudhran, I (nammAzhwAr) told that bhagavAn is the real creator/annihilator and not because of my bias towards srIman nArAyaNan. Thus, nammAzhwAr refutes the kudhrushtis (ones who misinterpret vEdham) in this pAsuram. This entry was posted in thiruvAimozhi, thiruvAimozhi 1st centum on April 10, 2015 by Sarathy Thothathri. Note: In this pAsuram, pancha bhUthams (five elements – AkAsam/ether, vAyu/air, agni/fire, jalam/water, bhUmi/earth) are explained as the raw-material for the variegated material manifestation. As part of srushti (creation), bhagavAn creates upto pancha bhUthams himself and subsequently gives control to brahmA and others to proceed with the variegated creation. Similarly as part of praLayam (annihilation), he let rudhran, agni, etc., do the initial annihilation and he finally consumes them as well. In the previous 3 pAsurams, it is established that the svarUpam (true nature), sthithi (existence) and pravruththi (actions) of jagath (material realm) are all under the full control of bhagavAn through sAmAnAdhikaraNyam. In this pAsuram, it is explained that this sAmAnAdhikaraNyam is bound by the sarIra-Athma bhAvam of jagath and Iswara – that the entire realm (consisting chith and achith) is the body and bhagavAn is the antharyAmi of everything. After explaining the total control of bhagavAn over the nature, existence and actions through sAmAnAdhikaraNyam and vaiyadhikaraNyam in the previous pAsurams, the sarIra-sarIri bhAva sambandham (the body – soul relationship) between the material realm and bhagavAn is explained here. It is also explained that “since the material realm is totally under the control of bhagavAn, it is his body” as the body is fully controlled by the in-dwelling soul. Next, this sAmAnAdhikaraNyam is explained as bound by the body-soul relationship between the material realm and bhagavAn. Previously nammAzhwAr explained sAmAnAdhikaraNyam to explain it further in this pAsuram. The result of such sAmAnAdhikaraNyam is sarIra-Athma bhAvam (body-soul aspect of the material realm and bhagavAn). It can also be said that the sAmAnAdhikaraNyam is bound by the sarIra-Athma bhAvam principle. It is explained in chAndhOgya upanishath “anEna jIvEna AthmanAnupravisya nAmarUpE vyAkaravANi” (I enter into all matter through jIvAthmAs to give them distinct names/forms that signify creation). Instead of being like a clay pot which is just made of clay, bhagavAn stays as the antharyAmi of all entities and controls those entities fully just like an AthmA (soul) stays as the dhAraka (protector), niyAmaka (one who controls) and sEshi (the master). It is explained that this sarIra-Athma bhAvam is the driving force for the previously explained sAmAnAdhikaraNyam. When it is is said that “dhEvadhaththa is standing on a tree”, there is no sarIra-Athma bhAvam (but when it is said that “bhagavAn is everything”, there is sarIra-Athma bhAvam – bhagavAn is the AthmA and everything is his body). bhagavAn is the supreme lord who becomes (creates) all of the material realm having first created the strong ether, fire, air, water and earth as the source and pervades all of them. He is pervading in everything similar to AthmA is pervading in the body. Not only that, he is present inside and outside of everything. He is the main object of the most radiant vEdham, Such emperumAn consumes everything during praLayam and is glorified as “sura” (God). After AkAsam, agni is listed instead of vAyu (as done normally) by nammAzhwAr. This is because in thathriya upanishath AkAsam is given importance in “Athmana AkAsa sambhUtha:” (From brahmam, ether came into existence) and in chAndhOgya upanishath agni is given importance in “thaththEjOsrujatha” (in the beginning, being alone, brahmam created fire). From this, srushti (creation), samhAram (annihilation) and antharAthmathvam (being antharAthmA) are all under the full control of bhagavAn. bhagavAn pervades everywhere and controls all entities just like the AthmA controls the body. Thus being totally distinct from achit and three types of chith (nithya – eternally free, muktha – liberated, baddha – bound), being free from all blemishes and full of all auspiciousness, being the one who creates, sustains and annihilates the whole of material realm as a sport, being the antharAthmA of everything (other than him), being not affected by the defects of chith and achith since he is not bound by any karmA is explained as the supreme lord in detail through vEdham which is blemishless due to not being created by any individual, which is understood through smruthi, ithihAsams and purANams, which is unrefuted, radiant and authentic pramANam (source of knowledge). piLLAn lists over 30 pramANams from vEdham, upanishath, bhagavath gIthA, etc., to establish this principle. With this lOkAyatha (chAruvAka), mAyAvAdha, bhAskarIya, yAdhava prakAsa, etc., philosophies which are contrary to vEdham are refuted. thida visumbu – thidam (dhrudam) indicates long lasting. This adjective can be given to all five elements, since they remain little longer than the variegated material manifestation. Otherwise, it can be said only to AkAsam – which is created first even among the five elements and consumed in the end – so even among the five elements, AkAsam is more long lasting. This is also indicated to refute lOkAyatha philosophy which accepts only 4 elements (except ether). ivaimisai padar poruL muzhuvathumAy – Having these five elements as cause and the variegated manifestation as the effect. Here “Ay” (become) should be understood as “Akki” (created). nammAzhwAr uses the term “Ay” due to his familiarity in vEdham (thaiththirIya upanishath) which says “bahusyAm” (he became many). This is how vaidhikas establish their philosophy through vEdham. 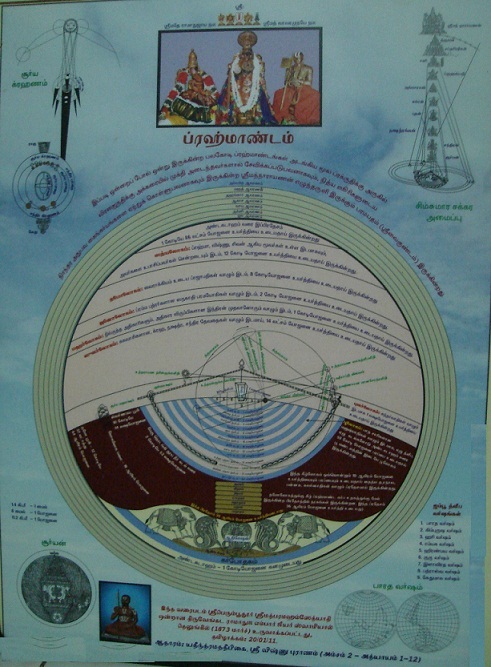 avai avai thoRum – Unlike many pillars that support a ceiling (where the pillars are separate from the ceiling), bhagavAn pervades all entities like its said in “jAthi vyakthithORum parisamApya varthikkumApOlE” (the category of an entity pervades all through the entity – here jAthi indicates – dhEva (godly), manushya (human), thiryak (animal), sthAvara (plant). If there is a human, humanness will pervade each human fully in all the parts of the human as well. Similarly, bhagavAn pervades all entities everywhere). udalmisai uyirena – Similar to AthmA being the protector, controller, master of the body, bhagavAn is the protector, controller, master of everything. (Note: Its important to also understand the distinction between AthmA pervading body which happens through gyAnam (knowledge) and bhagavAn pervading everything through svarUpam (himself existing in every thing)). 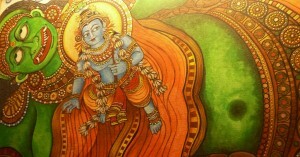 engum karanthu – Even though he is all pervading, the pervaded entities may not know him since he is hidden inside them. He is spread inside and outside – everywhere. uLan sudarmigu suruthiyuL – Such emperumAn is explained in detail in vEdham which is apaurushEyam (not created by an individual) and nirdhOsham (flawless). sudarmigu – It is so radiant and cannot be discarded through arguments as in the case of prathyaksham (perception) and anumAnam (inference). suruthi – sruthi – that which is continually taught orally through generations. With this, all principles that are explained starting with the first pAsuram until now is based on the flawless vEdham. ivaiyuNda suran – one who consumed (annihilated) everything (in the material realm). Previously creation was attributed to bhagavAn. If annihilation was attribute to some one else, that will minimize the glory of bhagavAn. So, nammAzhwAr establishes that samhAram is also under the control of bhagavAn. Through “ivayiyuNda suran“, nammAzhwAr refutes the kudhrushtis (ones who misinterpret vEdham) who say srushti/samhAram are conducted (independantly) by other dhEvathAs. Through “thida visumbu“, nammAzhwAr refutes lOkAyathas (chAruvAka who dont accept vEdham as pramANam) who do not accept AkAsam as an element and only accept 4 elements. Through “udal misai uyir“, nammAzhwAr refutes adhvaithis who consider everything is one (as it is established that bhagavAn controls all different entities). Through “sudarmigu suruthiyuL“, nammAzhwAr acknowledges srIman nArAyaNan‘s parathvam (supremacy), lakshmIsambandham (relationship with srI mahAlakshmi), etc., that are explained in purusha sUktham, etc. This entry was posted in thiruvAimozhi, thiruvAimozhi 1st centum on April 9, 2015 by Sarathy Thothathri. This pAsuram explains that the actions and inaction of all chith (sentients) and achith (insentients) are under the adhInam (control) of bhagavath sankalpam (divine will of bhagavAn). nammAzhwAr explains that all actions/inaction are under bhagavAn‘s control through sAmAnAdhikaraNyam. nammAzhwAr explained previously that the sustenance of leelA vibhUthi is under the control of bhagavAn. In this pAsuram, he explains that leelA vibhUthi’s pravruththi (actions) and nivruththi (inaction) are working under the divine will of bhagavAn. emperumAn is the controller of all entities for their actions (such as standing, sitting, lying down, walking, etc) and inaction (not standing, not sitting, not lying down, not walking, etc). Such emperumAn is inconceivable and being distinct from all other entities . He is our lord who is firmly established by sAsthram which is the strongest and most authentic evidence. Instead of quoting niRRal, iruththal, etc., (the actions), AzhwAr quotes (ninRanar, irunthanar, etc) the persons who have such actions/inaction. This is because actions/inaction always depend on the individual. Since, previously it was established that all chith (sentients) and achith (insentients) are under full control of bhagavAn, here the focus is on the actions/inaction of such entities. A question is raised – it looks OK to say actions require bhagavAn‘s will. But does inaction require his will? Yes, even to be detached from sinful activities, unless bhagavAn allows, such thing cannot be accomplished. So, both actions and inaction require bhagavAn‘s approval. Since bhagavAn has many prakArams (attributes/aspects), he cannot be limited to any one attribute/aspect. “em” emphasises personal favour received by him from emperumAn. 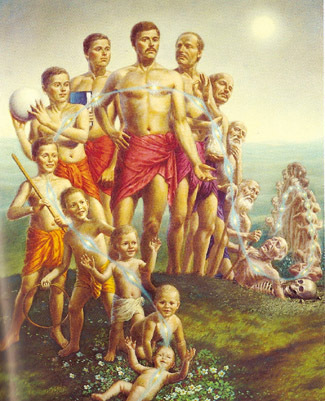 Though ninRanar (one who is standing), etc., are identified instead of niRRal (the action of standing), etc., this pAsuram is focussed on establishing that the actions (and inaction) of everyone is under the control of bhagavAn since the individual entities themselves under the control of bhagavAn is previously established. An example is cited for this aspect from yajur vEdham. “aruNayA pingAkshayA sOmam krINAthi” (Purchase sOma plant by giving red colored cow with golden eyes). Already it is explained in other places that cow should be given in exchange for sOma plant. So, the important aspect is red color and golden eyes. Similarly, since the all sentient/insentient entities being under full control of bhagavAn is already explained – so the focus is on the actions/inaction of all entities. But if we take this example, sAmAnAdhikaraNyam cannot be explained. So, in this case, it is explained that standing, etc., are the aspects of jIvAthmA and that jIvAthmA is fully dependant on paramAthmA. Thus, all actions/inaction are under the full control of paramAthmA/bhagavAn. ninRilar … – When some one asks embAr “It is understandable that ones actions are dependant on bhagavAn. But does inaction depends on bhagavAn?”. embAr replies “When thrisangu was pushed down from svargam, viswAmithra stopped him from falling. So, even for negating an action, unless bhagavAn‘s will is there, that will not happen”. enRumoriyalvinarena ninaivariyavar – Even if one keeps on trying as long as time exists (eternally) he cannot comprehend the true nature/attributes of bhagavAn. enthidar – bhagavAn is emphasised greatly in vEdham which is most authentic due to it being apaurushEyam (Note: apaurushEyam means not written by any person – not even by bhagavAn himself. bhagavAn only reveals the eternal vEdham time and again). This entry was posted in thiruvAimozhi, thiruvAimozhi 1st centum on April 4, 2015 by Sarathy Thothathri. An AchAryan (guru)’s glories were discussed in detail in the previous pAsurams. A person catches hold of his AchAryan’s lotus feet and treats it as everything in his life, after realizing his significance. If a person is able to understand the stature of such a person (sishyAs) who had caught his AchAryan’s feet, he must be really intelligent. People who does not understand the glories of a person who treats his AchAryan as everything, would say, “Well, why would he go after his AchAryan as everything. Why does he consider him greater than even sriman nArAyaNan? Why does he wander after all behind his AchAryan?” Whatever may be the complaints that these people say, this pAsuram answers those questions. In the very questions that these people pose, there is an implicit point imbibed in it. There is a group of people who are behind sriman nArAyaNan after listening to HIS glories, form, divine qualities, reincarnations, stories etc., If these people who go after perumAL ask those other set of people who go after their AchAryan as everything as to, “Why do you folks not go after the supreme lord and go behind just a mortal human being called as “AchAryan”? This pAsuram answers these probable questions from these devotees of perumAL HIMSELF. Any blasphemy on the part of worldly people about these guru bhakthAs and the questions imposed by the perumAL devotees are in fact to be treated as glories rather than complaints/scolding. This particular grammatical structure is known as “vanja pugazhchi aNi” in thamizh. We can look at an example to this. Once upon a time, during the times of svAmi rAmAnujA, there were lots of people standing near the punnai tree in srirangam. svAmi rAmAnujA was also standing there with other people, waiting for perumAL’s procession to start. svAmi rAmAnujA was standing near perumAL. Lots of devotees came towards svAmi rAmAnujA and prostrated before svAmi rAmAnujA and went. There was a cholA poet who served as poet in the kingdom. His name was “udayAr subramanya bhattar”. He was watching this with curiosity. With a willingness to know the reason for this, the poet went towards svAmi rAmAnujA and asked, “Hey! jIyarE! I want to know something from you”. svAmi rAmAnujA replied, “yes. Please go ahead with what you wanted to ask”. The poet replied, “I do see that there are lots of people who come towards you and prostrate before you. They seem to relish doing this and you, who is standing right besides perumAL, do not oppose them and seem to gladly accept their prostration. You never seem to hold them off from prostrating. Why is it that you do not say anything against them when they prostrate before you”. svAmi rAmAnujA replied, “Well, this is a question that needs to be asked. It is a very good question. But I am astonished by the fact that this is coming from you”. The poet was little perplexed and said, “What is so great about me”? svAmi rAmAnujA answered, “well, you are doing royal service. There are lots of people who come to your king. If there is something that a person wants from the king, he would take the king’s sandals and keep them on his own head and would honor him. The king would knew that the other person is keeping the sandals on his head to honor him and is an act of pleasing the king on his part. Knowing this, the king would ensure that the person is guaranteed of his wish, whatsoever it may be. Does this mean that it was the sandals that did the job for that person? It is only the king that does the job for the person and not the sandals. You have seen this incidents a lot of times when you were in the kingdom. Similarly, here, perumAL is the king. Adiyen is like perumAL’s sandals. People who want anything from perumAL, try to please perumAL by prostrating before me who is serving like sandals to HIM. perumAL ensure that HE does the job of those who express their love and affection towards me. That is why they prostrate befoe me. The poet “udayAr subramanya bhattar” was flabbergasted to learn such a treasurable meaning from svAmi rAmAnujA himself. Thus, it can be seen that there is a possibility that those who are bhagavath devotees (devotees of sriman nArAyaNan) may condescend those people who have AchArya bhakti. The former group of people need to understand about the greatness of devotees of AchAryA. Even if they fail to understand and start condescending the AchAryA devotees, it will only go ahead and prove the greatness of AchAryA devotees. alagai mulai suvaithArkku: The word “alagai” refers to a demoness. Even thiruvaLLuvar says “vayyathul alagayyA vaikkapadum”. “alagai” refers to pUthana, the demoness who came under the guile of yashOdha. She was been sent by kamsa inorder to kill krishnA who was growing at thiruvAipAdi. pUthana tried to kill krishnA by feeding HIM with poisonous milk in her breast. 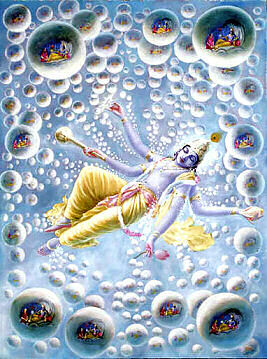 krishnA not only sucked the milk but also sucked her life along with HIM. This story is illustrated in a lot of places. For example, thirumangai azhwar uses the phrases, “peRRA thAi pOl vandha pEychi peru mulaiyUdu uyirai vaRRa vAngi unda vAyAn” and “kaNN sOra vengurudhi vandhizhiya vendhazhal pOl kUndhalALai maNsOra mulaiyuNda mAmadhalAi”. svAmi nammAzhvAr says “vidapAl amudhAga amudhu seydhitta mAyan”. This story is taken here to say that the devotees immerse themselves in the glorious feet of krishnA. thiladhamena thirivAr thammai: Thus, those people who are devotees of their “AchArya” and other bhAgavathAs, who are devotees of perumAL HIMSELF, are actually revered as “the greatest”. All the greatest ancestors have celebrated the people who wander about everywhere praising the glories of other bhAgavathAs and their AchAryas. “thilakam” is the forehead impression that the ladies keep. It denotes auspiciousness and hence, these people who are devotees’s devotees are being praised and celebrated as the most auspicious. ulagar pazhi thURRil thudhiyAgum: When a layman comments on a person who is a devotee’s devotee as “Look at this person. He is going behind another person (devotee of perumAL) without knowing the roots of that person. He does not know his caste, his current situation etc. He is simply following this person and treats him as the object of attainment and thereby ignoring perumAL”. If this was the negative comment, then this infact is not a negative comment / complaint or a blasphemy, rather, it goes ahead to prove the diving qualities of that person who regards his AchAryan and other bhAgavathAs as his everything. Hence, these are not bad comments and complaints, instead they are noteworthy praises. thURRAdhu avar ivarai pORRil adhu punmayEyAm: Now let us consider the flipside of the coin. There is a possibility that these laymen may heap loads of praises on these devotee’s devotees. Does it really mean a praise in the first place? If not, what does it mean? These laymen does not do any kind of things that they are supposed to do in the first place. They do it superficially or not do it at all. On top of it, they comment on those people (devotee’s devotee) after observing a few of their routine tasks superficially and comment as in “These people do abide by the shAsthrAs”. They utter these comments based on superficial observations and so does not mean anything. They say these just because they think that other people should think about them that they are also people with compassion towards others and show respect on others. However, the fact of the matter is that, people with such superficiality how much ever they praise, it would never match the glories of those devotee’s devotees. Rather it would only back fire and considering their stature, it would be just an insult. adiyArkku adiyAr: The entire group of devotee’s devotees are the peak of glory for the entire world. They can also be termed as “thilakam” for devotees themselves. If the worldly people were to complain about them that they do not go behind perumAL and instead go after a human being, then that is not a complaint. It is just a praise. Thus, we saw the significance of being a devotee’s devotee. Detailed Explanation: “In srirAmAyaNam, rAma, lakshmanA, bharathA and shathruganA stood by good virtues and served as an example for others to follow. Among the four, it was shathruganA who was being celebrated by our ancestors. The reason is because shathruganA served as the devotee of his brother bharathA, who was inturn a great devotee of his brother rAmA. shathruganA did all kainkaryam to his brother bharathA and served as an exemplar of this stature namely “devotee’s devotee”. It would be good to note the following excerpts of svAmi nammAzhvAr here: “thondar thondar thondar thondan satakOpan”, and “adiyAr adiyAr adiyAr enkOkaL”. svAmi thirupAnAzhvAr says “adiyArkku ennai Atpadutha vimalan”. svAmi thondaradipodiAzhvAr says “adiyArkku ennai AtpaduthAi”. svAmi periyAzhvAr says “adiyArgal em thammai virkavum peruvArgaLe”. svAmi kulasEkarAzvAr says “thondar thondargaLAnavar”. All these reinforce the fact that these AzhvArs wanted to be in the same state of being “adiyArkku adiyAr” (devotee’s devotee). The author of this very book namely svAmi aruLALa perumAL emberumAnAr, regarded his AchAryan svAmi rAmAnujar as everything and served him. He is a person who is described by the phrase “anbar adikku anbar” and “thiladham ena thirivAr”. This is the reason why svAmi aruLALa perumAL emberumAnAr is celebrated as “theruLArum madhurakavi nilai theLindhOn vAzhiyE”. We can see more example to this. svAmi thiruvarangathu amudhanAr served the devotees of svAmi rAmAnujA and wrote the book “rAmAnuja nURRandAdhi”. Likewise, similar instances could be seen in svAmi parAsara bhattar and nanjIyar’s live history. svAmi maNavALa mAmunigal served as svAmi rAmAnujA’s devotee and sang “yathirAja vimshathi”. svAmi eRumbiyappA served as svAmi maNavALa mAmunigal’s devotee and sang “pUrva dhinachari”, “uthara dhinachari”, “varavaramuni shathakam”, “varavara muni kAvyam”,”varavaramuni champu” etc. In one of these, he says “serukillAdhavargaLum AchArya nishtaigaLil irupavarum, shAsthira sArArthangaLai aRindhavarum paNathAsai, peNNAsai mudhaliya AsaiyaRRavargaLum, perumayaRRavargaLum, anaithu uyirgaL idathil anbu udayavargaLum, kObam, ulObam mudhaliya kuRRangaLai kadindhavagalumAna maNavALa mAmunigalin adiyArgaLodu adiyEnukku enRum uRavu undAga vENdum”. This means that svAmi eRumbiyappA wishes to have eternal relationship with those devotees of svAmi maNavALa mAmunigal who are characterized by these good deeds: lack of pride and haughtiness, immense AchArya bhakti, knowledge of shAsthras and its esoteric purports, lack of materialistic desires including wealth and women, lack of need to be famous and to be noted, love towards all living beings including birds and animals, disgust towards bad characters like anger, lust etc. Hence it can be thoroughly seen that all “AzhvArs and AchAryas desired and relished only to be a devotee’s devotee. This in itself is the cream of the cream of all acquired knowledge by whatsoever means.” Hence, this particular point is being told towards the end of this book. This entry was posted in gyAna sAram, Other on April 2, 2015 by santhanam rajagopalan.